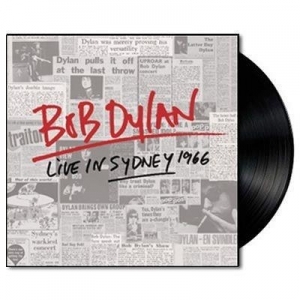 Bob Dylan Live In Sydney 1966' is the first time that Bob Dylan's concert, recorded on April 13, 1966, and the at the Sydney Stadium, has been available as an official Bob Dylan release. The first concert of his 1966 World Tour outside of the US, it is being released as a one-pressing only limited edition 2LP-set. The show was originally recorded by TCN9 for TV broadcast, and is one of the only recordings from the 1966 tour that still exists in its entirety, and also its audio quality. Australia was the first major stop (outside the US) for Dylan's legendary World Tour in 1966. The fortunate few thousand here who witnessed it saw what proved to be the watershed moment in Dylan's career. It was the culmination of Dylan's evolution from folkie icon to fully-fledged rock star, which had begun with his controversial "electric" debut at the Newport Folk Festival on July 25, 1965. The punishing schedule of the 1965-66 period - three landmark albums somehow crammed in around a frantic round of tours and other engagements - took its toll on Dylan. The '66 world tour was to be his last major concert outing for almost 8 years.